The Tomb of the Patriarchs (Abraham and Sarah, Isaac and Rebecca, Jacob and Leah) in Hebron in the West Bank. 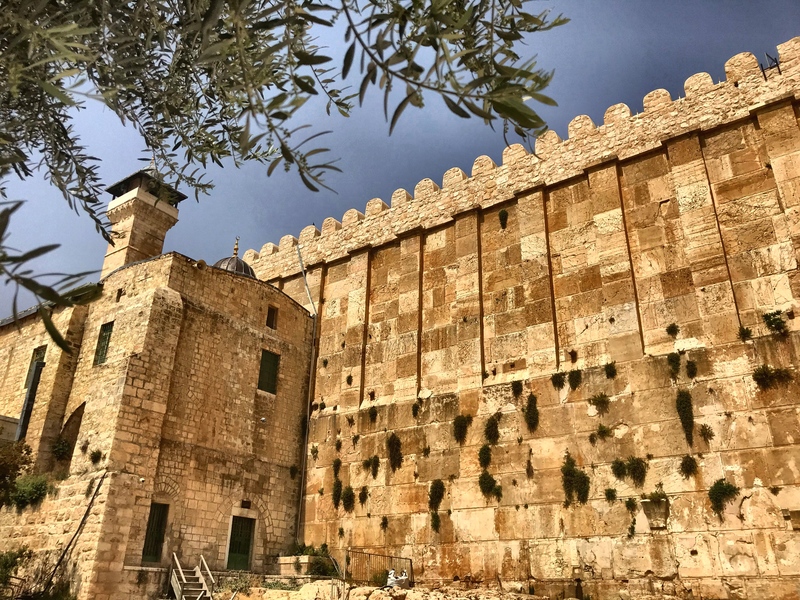 The building was constructed by King Herod. If I had a shekel for every time that was said while I was in Israel and Palestine, I would be as rich as King Solomon. But the truth is: “It’s complicated” essentially sums up the situation. Having spoken with both Palestinians and Israelis, there is no easy solution to the problem. Why? I think I will lay the blame on the United Nations. When it was decided, about 70 years ago, that the Jews that were being killed and chased of out of Europe deserved a Democratic State of their own, the Arabs who were living in Israel were forced out, killed, or herded into refugee camps. And that’s when the United Nations began the big lie. The Palestinians were told that someday they would be given the “right of return”. And are still being told so. But two generations or so later, they remain in refugee camps or trapped in Gaza or scattered across the West Bank and the rest of the world. There are probably now more than five million Palestinians who have been promised the right of return. And to put it bluntly, there is no way in hell that Israel is going to risk losing its Jewish state to an Arab majority. All the Israelis I spoke to, whether in the IDF, Knesset, or Arab themselves, all felt that the state might be willing to make sacrifices for a two-state solution. They would be willing to give up their settlements in the West Bank and lose Holy Sites like the graves of the Patriarchs in Hebron, in order for the Palestinians to have their own state. Palestinians, on the other hand, whether in the PLO, shop owners, or residents in refugee camps, are insistent on their right of return. Two generations of Palestinians have been raised on the narrative that God and justice demand that they be allowed to return to their forebears’ land in Galilee. Since March, this dream, fed by the discontent of living in a kind of prison along the Mediterranean coast, victimized by Israeli and Egyptian blockades and Hamas mismanagement, has inspired the Gazans’ demonstrations and in some cases suicidal moves against the border. It’s impossible to fault Palestinians for trying to go home. It’s impossible not to fault the IDF for overreacting, for using live ammunition against people throwing rocks. And yet the young soldiers and their commanders are also products of trauma narratives, not only the whole of Jewish history (including two millennia of Christian antisemitism) but also the second intifada from 2000-05, in which 1,100 Israelis died and 3,000 were injured. Proportional to Israel’s population, that’s Vietnam. Or Pearl Harbor. Or September 11. Think about what such moments do to a nation’s heart. When children throw rocks, look not just for terrorist masterminds. Look for their hunger for home (an impulse common to all human experience) and all Gazans’ urgent hunger for economic opportunity, shelter, electricity, water, and enough to eat. When an army has a hair trigger, look not for evil hearts or even right-wing governments. Look for the perception and indeed reality of existential threat. Is there a solution that’s acceptable to both sides? It’s complicated, but the one thing I do know is that the only solution will have to be worked out by Israel and Palestine. What they probably need less of, though, is having possible solutions West-splained to them.